The Foundation has the enduring mission and obligation to be the leading voice of safety for the global aviation community. We do this by bringing safety specialists together to freely discuss important issues that affect the aviation industry each day. Safety is not static, and the industry must continuously invest in it, both within its own companies and also as a part of the larger conversation. 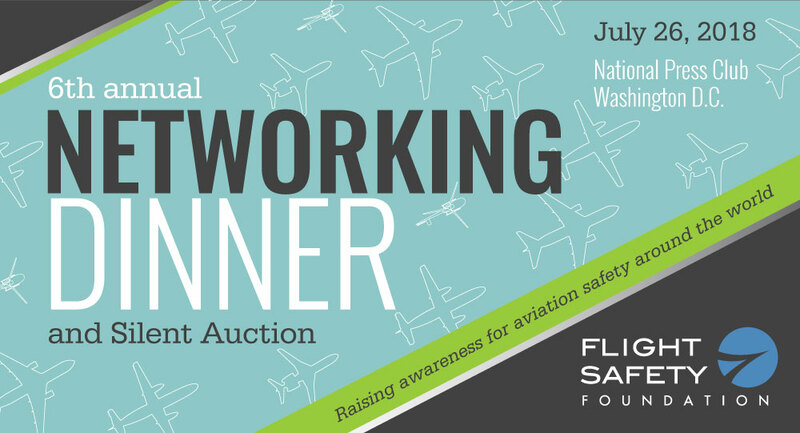 The annual Networking Dinner and Silent Auction is an opportunity to connect with your aviation safety peers for an evening of education, good food, lively conversation and, of course, fun! The event will feature a networking social hour, silent auction, dinner and a program that will include appearances by the Foundation chairman, president, and a special guest speaker. Show your organization’s support for flight safety through sponsorship of a table (10 seats) for US $5,000. Sponsored tables receive recognition on the event program and website, and verbal recognition at the event. Purchase a table sponsorship online. Individual tickets to the event are US $250 each. Purchase one or multiple tickets online. A silent auction will take place alongside this networking dinner. Last year’s auction drew great prizes and a lot of competitive bidding from the crowd. Large model airplanes, airline tickets, fine wines, books and hotel stays were just a few of the items that were on last year’s list, and we hope for an even better selection this year. View our items for the auction here!